Easy to use and archival safe, horizontal zip closure envelopes protect materials from the elements. Dust and water resistant seal. These Art Profolio PolyZip Envelopes seals out the elements to help resist dust and moisture. An expanding gusset provides flexible storage for a single or a stack of art and photo materials; Ideal for carrying supplies and organizing projects too. 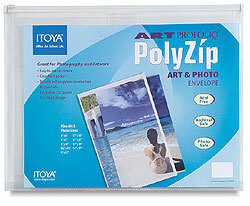 The Art Profolio PolyZip Envelopes also have a single sheet pocket in the front for a routing slip or a content sample.